Concertos for the timpani or kettledrums, the big boys of the orchestra, are certainly unusual but not entirely neglected. In recent times, even minimalist composer Philip Glass tried his hand at the genre. The heyday for timpani concertos, however, was in the early Classical era when most of the works on this CD are written. Timpani are pitched drums, of course, but the instruments can hardly be used to play tunes, at least in the customary sense of the word. That doesn't make it impossible for them to step into the spotlight as stars or even soloists. In their early history, these drums were associated with war and pageantry. In concert music subsequently written for them, the pomp and pageantry seldom are far away. Especially when combined with brass, their prominent use amplifies the music's gravity and grandeur. (At least the bloodshed can be done without!) There are accounts of virtuoso timpanists playing on as many as 16 drums at one time, a feat which seems only slightly less incredible when one realizes that timpani in use during the 1700s were quite a bit smaller than their modern counterparts. One of the great timpani virtuosos was Georg Druschetzky (1745-1819). His career took him to Linz, Vienna, and what is now Bratislava. Like Mozart, he was dependent on patronage for survival, and his surviving works are associated with his tenures with Archbishop Joseph Anton Johann and Cardinal József Batthyány. The two works recorded here sound like minor (but enjoyable) works by Josef Haydn, albeit with the drums' overlay of ceremonial importance! Johann Melchior Molter (1697-1765) is remembered for his trumpet concertos, but he composed concertos for many of the instruments in his patron's court orchestra. 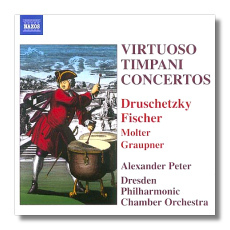 Unlike Druschetzky, it does not appear that Molter was a timpanist. Nor is there much evidence that Johann Carl Christian Fischer (1752-1807) and Christoph Graupner (1683-1760), who also enjoyed royal patronage, played the timpani. If Mozart had spent the first part of his career not composing for Salzburg's Archbishop Colloredo but for Budapest's Archbishop Johann, the repertoire for timpani might contain some real masterpieces! The brief Marche de timballes, written by the brothers André and Jacques Philidor in 1685, is perforce more antique in style. It appears that this music served to accompany Louis XIV's carousel! Alexander Peter plays these works as if they were the most important music ever written, and he is sensitive to period performance practice. He even went so far as to compose cadenzas for Druschetzky's Concerto for Six Timpani and Orchestra in period style. His orchestra is excellent, and the booklet notes, both scholarly and readable, are by another master of the timpani, Harrison Powley. Although, this disc is off the beaten path, it should fascinate anyone with a passion for the lesser-known composers of the 18th century. Recommended!